Schwarzgeld – black money !!! Ich wünsche allen Lesern ein erfolgreiches und gesundes Jahr 2010. Vor fünf Jahren hatte ich einen Tresor zu öffnen nach einem Angriff mit einer Thermolanze. Das Schloss war total zerstört und alle Notverriegelungen ausgelöst. I wish everybody a successful and healthy year 2010. 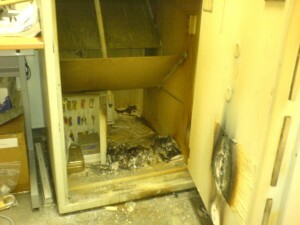 Five years ago I had a customer with a safe which had to be opened after a thermic lance attac. The lock was totally destroyed and all relockers set off. LOL That’s something I always think when I see a thermal lance opening a safe,does not burn everything inside? money and papers all burn, but jewelry? when it opens in this way, you expect to recover? sorry i want to say ” when you open in this way, what you expect to recover?” sorry about bad english.